Christmas is rapidly approaching – meaning that life is about to become busy beyond reason. But there is still time to squeeze in one last batch – this time a dry-style stout. This makes for the 16th batch of beer this year; less than I had hoped, but perhaps a reasonable amount when you factor in the rounds of cider and wine also brewed this year. Excitingly, for the first time I’m using my birthday present – grain mill – plus a few kilos of the grain currently taking up most of my pantry. As I write this I am shivering out in my garage – its a brisk -8C outside today. Winter brewing is officially here! As for the recipe, it is a bit off of the BJCP style for a dry stout – the gravity & grain bill are pretty much normal, but the bitterness level is nearly half of normal – 18IBUs. This odd formulation is an attempt to replicate the first good beer I ever brewed – brewed more than 15 years ago and despite several attempts never replicated. As I’ve mentioned previously, I started brewing while in university, with the intent of making beer as cheaply as possible. For the first year of my homebrew career I brewed dozens of batches of beer – all mostly corn-sugar, all horridly tasting, and all over 7%. Cheap & good for getting drunk was clearly the sole goal in those days. The story of how I got into all-grain, the background behind this recipe, and the recipe itself are found below the fold. Zoli, the proprietor who ran Prairie Brewers (a sadly now defunct brewshop in Calgary) caught onto what I was brewing, and in a somewhat deceitful manner, hinted that all-grain brewing would save me even more money. I took the bait, built a zap-tap lauter tun (if you don’t know what that is, consider yourself lucky – it takes about 6 hours with a drill to make one) and tried my first batch. I don’t remember the exact recipe, but I achieved what I had been brewing previously – strong, bad-tasting, and a few dollars cheaper than my prior extract batches. Hooked, I went to get the ingredients for the next batch. Zoli talked me into a few flavour grains; essentially those for a stout. No hops were bought – I had some fuggles left over from a previous brew – and a packet of nottingham finished off the ingredient list. I was shocked at the colour of the beer – this was in the days before craft brewing was big, so most beers in the store were still MCB’s (Molson, Coors & Buds). None-the-less I forged ahead, finished the brew day, fermented it out, and bottled the beer. The first sip of the beer forever changed my view on home brewing – it was delicious; roasty, not very bitter, and went down like water. My friends – who normally would only drink my homebrew after pre-drinking a few MCB’s – agreed. All to fast the beer was gone, but it left me a brewer now obsessed with making good beer. To this date I do not know what was in that beer – Zoli literally gave me a few unmarked bags of specialty malts that I dumped in the MLT. I know the hops were light – perhaps one ounce of fuggles went into the brew. It was 5%-ish, lots of roast malts, and had a head that wouldn’t quit. Even today – 15 years after that batch of beer – I still have a friend who asks me if I figured out how to replicate it. This is roughly attempt #20 at replicating that batch of beer. Don’t get me wrong – all of those stouts in between have been fantastic – but the experiment continues. I’ve narrowed into a grain bill that seems right, and am now playing with the hop content. Obviously, my memory is less than perfect, but I continue refining to achieve the same effect; if not the same recipe. -Hit somewhere between 68 & 69C -> MLT/grain were likely colder than entered into beersmith as it is -8C. -Cooled to ~66C @ 40min; conversion was not complete so mashed for an additional 5 min after which conversion was complete. -Added first 5L of sparge water at boiling as mini-mashout. I tried pre-conditioning my grain before milling – meaning I whetted it slightly to try and get the hull to come off in one piece, while still crushing the core into course flour. This was partially successful – most of the hulls were in one or two pieces, while the core were crushed into a medium-course flour. But some got over-whetted, leading to a pancaking effect. About 1/4 of the grain ended up this way. Despite that, my efficiency was higher than expected, meaning the mill is already improving my brewhouse efficiency. As per usual, I’m stuck in the garage. Its a brisk -8C outside, which makes keeping the mash at the desired temperature a bit of a challenge – indeed, I lost about 4C over my 50 minute mash. The mash still completed on time, but I collected slightly less runoff than expected – a consistent issue, which I need to rectify by altering my beersmith setting. 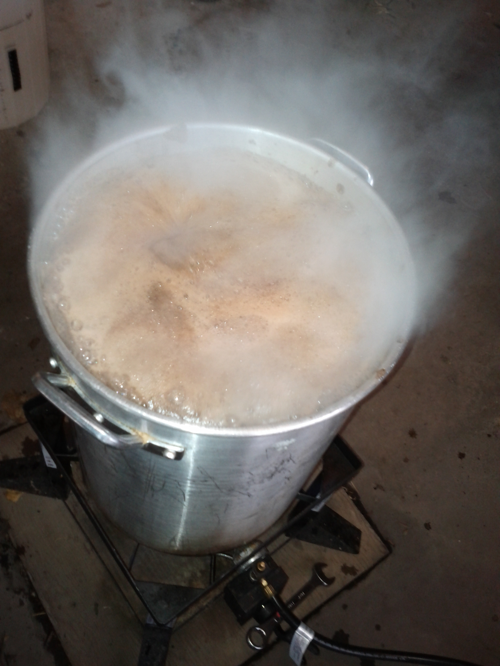 Otherwise, brewday was normal – hit my mash temperature dead-on, had a minor boil-over and froze my but off. It is definitely time to start wearing a touque while brewing!